Orcas vocalize while going about their various activities. The forehead (or melon of an Orca) is used to generate the wide variety of sounds the whale is capable of producing. Sounds are generated when the whale forces air in and out of the complex network of passages and cavities in the melon. 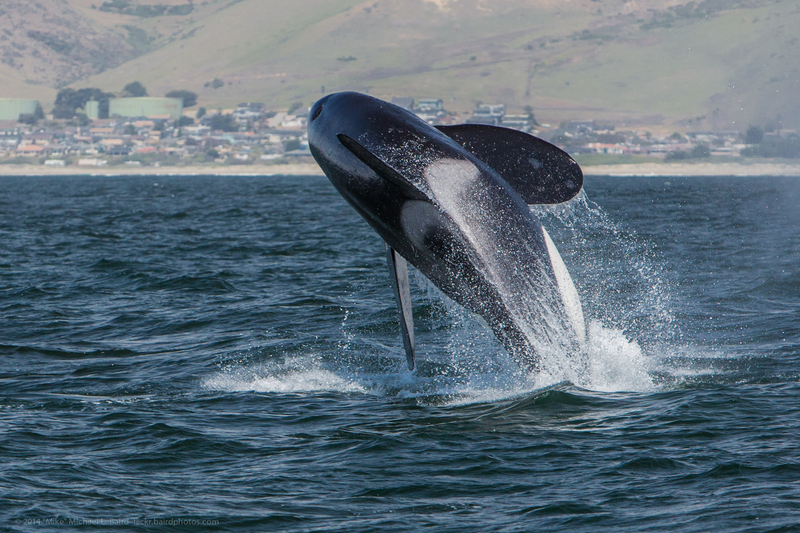 Resident, transient, and offshore killer whales have very different vocabularies. Both the sound of the calls and the number of calls vary substantially from population to population. Transient killer whales vocalize significantly less than residents because they normally don't use sound while foraging for food. Residents will send out calls to other residents and use sonar clicks to locate their prey. Transients, on the other hand, usually hunt silently, listening and looking for their prey. It is speculated that the reason for this is that the dolphins, porpoises, seals, and sea lions that constitute the transient's primary prey could recognize transient calls and thereby rob the transients of the advantage of surprise. Transients normally begin to vocalize during or after an attack. There are three different populations of Orcas encountered along the West coast of North America. These three groups appear to be genetically different and do not interact socially--in fact, observed behaviours indicate that they normally avoid contact with each other. There is evidence of genetic differences between the resident, transient, and offshore populations is that there are subtle differences in the shape of their dorsal fins. These differences are most consistently seen in females. One such consistent difference is the shape of the fin tip. Resident dorsal fins tend to have a rounded tip that terminates in a sharp corner. The dorsal fins of off shores tend to have tips that are continuously rounded. Transient dorsal fins tend to be more pointed at the tip, more closely resembling the dorsal fin of a shark. The examples above are a bit exaggerated, but illustrate the described differences. The resident population is comprised of groups of genetically related clans or extended family groups of Orcas. These clans have established territories and fairly predictable patterns of movement within those territories. 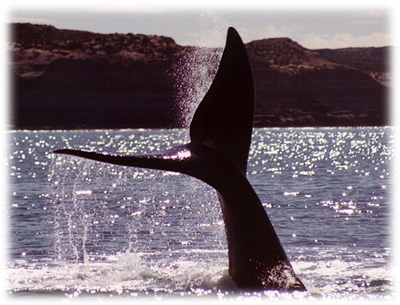 They travel in pods and sub-pods, often groups of up to 20 whales or more with individuals scattered over a wide area. Transients, on the other hand, have neither established territories nor predictable patterns of movement. They swim in small groups of two to five or six, usually in close physical proximity. Researchers have recently had several encounters with the third known West Coast Orca population, currently labeled the "offshore". 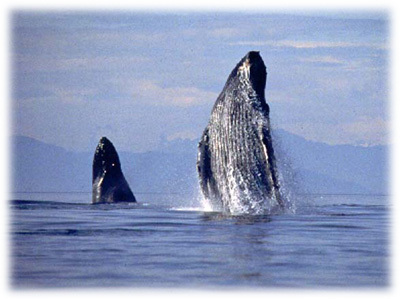 These whales have been encountered primarily in the open ocean, and in large groups of 30 to 60. One of the primary reasons residents, transients, and off shores exhibit different behaviours is that their diets are very different. Residents feed almost exclusively on fish, and exhibit a strong preference for salmon. At the moment it is believed that the off shores are exclusively fish eaters as well, but, given the relatively small number of encounters with the off shores, it can't be said with certainty. Transient whales feed primarily on marine mammals. Transients, observed in waters of B.C. and Washington State, have been seen preying on seals, sea lions, dolphins, porpoises, and other species of whales. Their diet, however, isn't strictly limited to marine mammals. Transient killer whales have also been observed eating sea birds, and the stomach of a dead transient whale recovered up in Alaska contained the remains of a moose. Apparently the moose chose the wrong moment to swim from one Alaskan island to another--something that moose, deer and other land animals frequently do. Gray Whales also known as: California Gray Whale, Devilfish, Mussel-Digger, Scrag Whale-Baleen Whale have no teeth. Baleen is long thick bristles that filter food from silt on the ocean's floor. 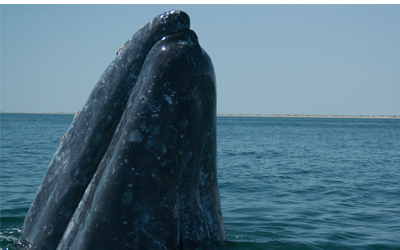 Unlike most baleen whales, the gray whale must get its food from the sediment on the ocean floor. The amphipods the whales eat can be found there. The favorite food of gray whales are amphipods. Amphipods are tiny shrimp like animals that live in sediment on the ocean floor. The whale's mouth will fill up with sediment. The amphipods living in the sediment will also enter the mouth. The whale will stay down for 3 to 5 minutes to eat. A trail of dents in the ocean floor is left behind where the whale hit the ground. The whale has no teeth to chew its food, so must swallow it whole. Instead of teeth, the whale has baleen. The baleen is made up of long fibers much like a broom. The baleen acts as a filter. When the whales mouth is full, it closes forcing the water out. The small animals the whale eats get caught in the baleen. When all the unwanted material has left the mouth, the whale swallows. The whale must surface to breath. It can only stay underwater for 15 minutes before running out of air. When it reaches the surface it will blow out a breath, creating a spout. Many whales migrate south for the winter, especially those that feed in northern waters. For the gray whale, the journey begins in the frigid waters of the Chukchi and Bering Seas. The whale spends the summer and a few fall months in the arctic waters before heading south. Around mid to late fall, the whales start their 5000-mile journey south to Baja California. Since whales travel close to the coast, many people enjoy going out on boats to view them. 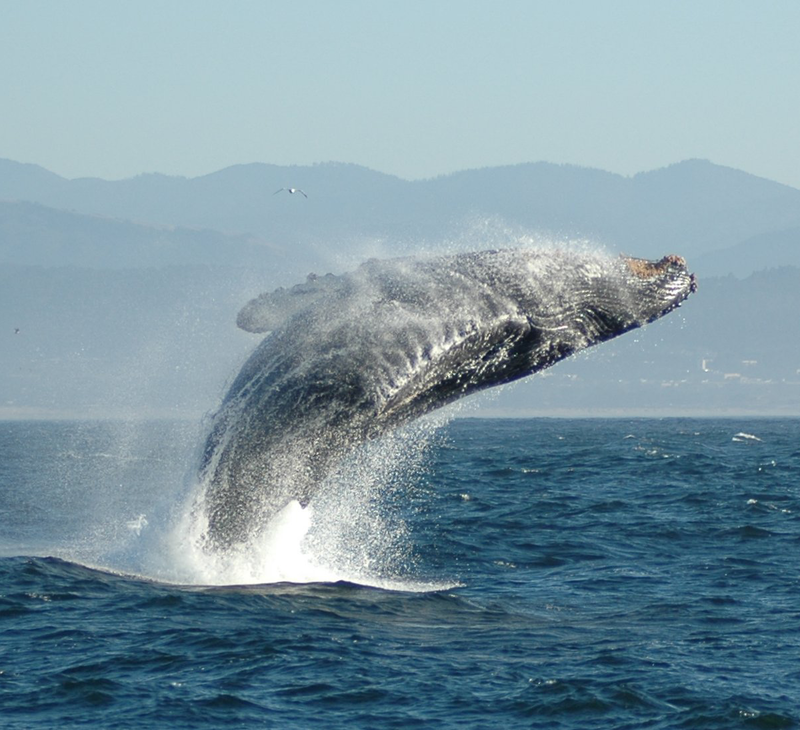 The gray whales are heading south for two reasons: shelter and breeding. 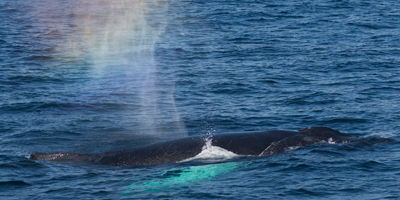 Spouting is the visible exhaling by the whale of air, water vapour, and water drops. Sometimes called a blow.